The compression is good and the prints are cute, but they won't stay up. About an hour after putting them on the tops start to roll down, and that starts a whole day of fighting with them. I measured them against some that I bought about 4 years ago, and they are at least two inches shorter. If cost is a concern, they should increase the price by a dollar or two instead of skimping on the fabric. I won't be buying them again. provides good compression for my vericose veins while I am on my feet most of the day. AND, I love the fun designs! My mother needs them and she loves flowers! I'm trying these out. I've never bought these before. I purchased 2 pair a bit ago & here I am back again to order 4 more pair. I love them! They are so comfortable, but yet do their job by making my legs & ankles feel better. They help keep the swelling in control also. They have so many options in colors & prints, too. I figure if I HAVE to wear them, I might as well have fun with them. My favorite ones are the Tie-Dye, Paisley, and Denim Striped. I would recommend them to everyone. I am going to Hawaii, and will wear these stockings to prevent a DVT on the flight. I have used in the past and liked the pattern. have a sprained ankle and leg fracture and need the support. These colors I will be able to wear with jeans. The compression will help reduce the swelling. 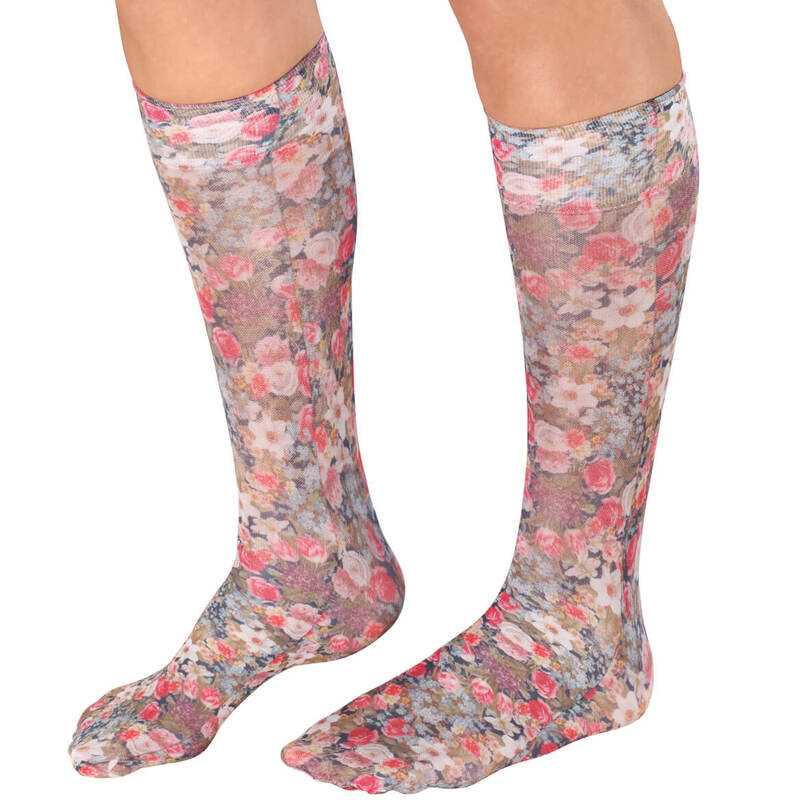 Needed new compression socks for travel (old ones stretching out); these are pretty as well as useful. Unable to find 8-15 mmHg at a local store. Something with some color to them might help me want to wear compression stockings more often! My doctor recommended that I wear mild compression socks to help with a circulation problem in my legs. I tried your Celeste Stein socks and absolutely loved them! They feel and look great and my leg condition seems to have improved since wearing these. So, I am ordering additional pairs in different colors. Will be flying within days after a surgery. I chose Miles Kimball due to price and free shipping. I chose the print because its alot prettier and can be worn anytime. I love the colors and variety. They last a long time. This is my second purchase of these socks because they are comfortable and have lasted me for more than 3 years. Since they have now started to fade from wear and wash, I decided to get some more. VERY UNIQUE COLORS ANS STYLES. Have had these stockings before and found them comfortable as well as fun to wear with shorts. They creat a conversation. I have a future daughter in law in her final year of nursing and these are attractive as well as functional for her. need these kind of socks, compression. prettier the better! I picked this item from here because it was less expensive than the brick and mortar store I checked and they had my size which the store did not! my Dr. recommended I wear these light compression hose at night. I have others and wanted an additional pair. I have a few of these socks in the queen size and they are very comfortable and come up high enough to nearly reach just below the knee. 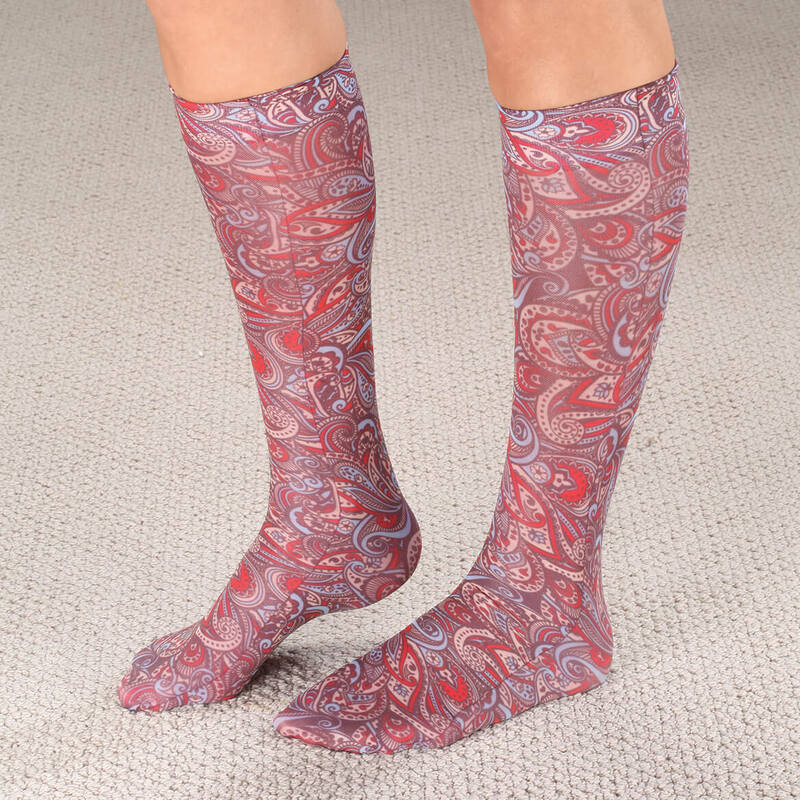 I needed compression hose and I wanted something more fashionable than the regular "icky" kind. apparently need compression socks, but can ROCK the colors you offer! Do you offer 20-30 mmHg stockings? BEST ANSWER: Thank you for your question. Yes, please type 20-30 mmHg in the search bar and our listings will pop-up for you. We hope this information will be of help to you. Is the price for a pair or 1 sock? BEST ANSWER: Thank you for your question. This is for 1 pair. We hope this information will be of help to you. BEST ANSWER: Thank you for your question. We do not know if these are carried in stores. We hope this information will be of help to you. Walgreen’s on line carrbies a full line of this brand at great prices. hi!! I have found them at Walgreens. Hope this helps!! If my calf is 38cm and my heel to toe is 45cm what size should I get? BEST ANSWER: Thank you for your question. Regular fits calf circumference up to 17”; Queen fits calf circumference up to 20".We hope this information will be of help to you. sock description not on picture, why aren't they labeled with the stocking? BEST ANSWER: Thank you for your question. Please refer to the more details tab in the description of the item to see the names of the colors matched up with the colors. We hope this information will be of help to you. Can't you offer these for short people? If they are too long and you try to fold the top down your leg swells and hurts there. BEST ANSWER: Thank you for your question. We apologize for any inconvenience this has caused. Thank you for taking the time to submit your comments. We have forwarded them to the correct department for review.We hope this information will be of help to you. What stores carry your socks? 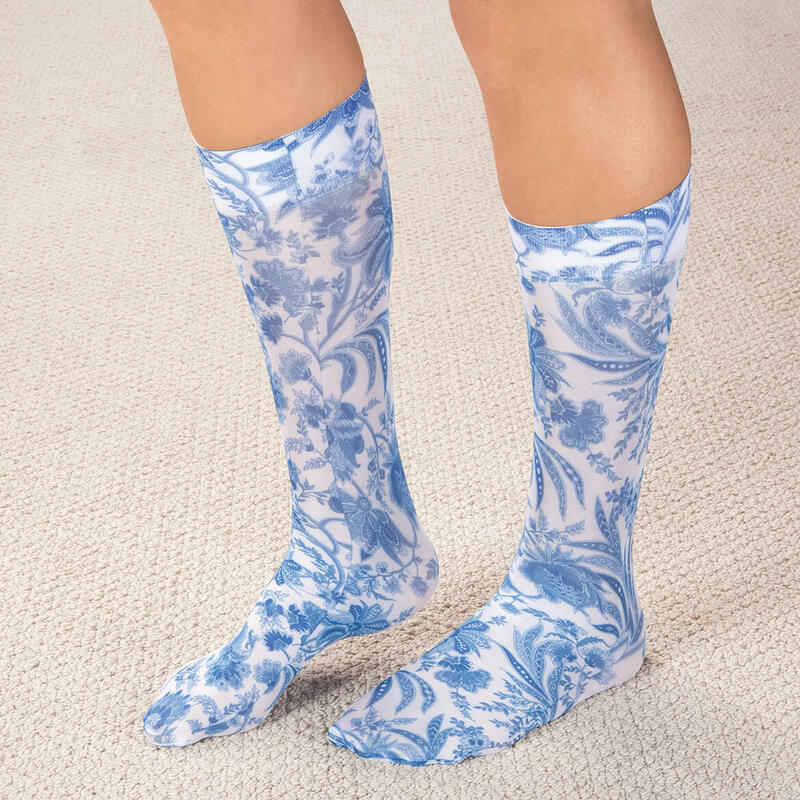 BEST ANSWER: I have only seen these compression socks in catalog magazines. Not in any stores.